I don't know about you but the cabinet where I keep my bowls and lids is not pretty! This cabinet also houses my measuring cups and measuring spoons which needless to say gets lost in the mess. I really need to do a complete overhaul of this cabinet but I'm taking baby steps and decided to start off with the measuring cups and spoons. First, you want to measure your cabinet door and cut the size of cork that will fit it. Keep in mind that cork sheets come in different thickness so be sure to get one that will work best for you. I already had some cork in my craft supplies so I used that. If you use a thinner sheet, like I did, the command hooks will work best. If you have a thicker cork sheet you can use push pins. You may want to use either double sided tape or Scotch re-stickable tabs, which is what I used so that the cork has something to stick against. If the cork you use is thin enough you may be able to just tack the cork around and under the edges of your cabinet door. Now you're ready to stick on the mini command hooks or push pins to the cork sheet. 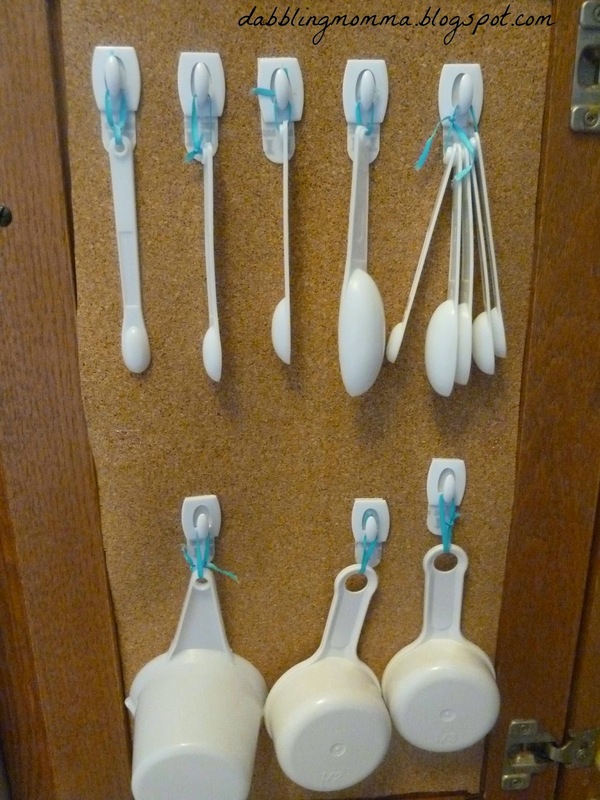 Finally, grab some ribbon or twine, loop it through the holes on the handles of your measuring cups and spoons, tie it off and hang!! Voila, you now have a new home for all your measuring cups and spoons! I never have to dig around anymore in a jumbled mess of bowls, lids and containers!! Where do you keep your measuring cups and spoons? Let me know in the comments below! My "measuring spoon/cup" drawer is also a mess. I love this idea! Thanks for sharing at the Teach Me Tuesday Linky Party:) I'll definitely be giving this idea a chance!